February 1, 2016, 9:07 PM · A vast number of details need to be worked out in creating a bow arm for a young violinist -- there is no panacea, no formula for the perfect bow arm. It would be wonderful if one method or one brilliant insight cleared up all the problems. Would bow changes be any more smooth if the fingers on the bow were spaced a certain way? If the wrist were high, flat or low, depending on the teacher’s style, would the sound be any more rich, gorgeous or huge? Bow arms are semi-conscious extensions of the violinist, especially in the youngest players. While well-trained children can play with good bow distribution and long, strong bow strokes, and play deeply into the string, in a straight path, and with no scratch, they’re usually moving their bows on a subliminal, non-thinking level. Children think and feel, but not necessarily in a linear, rational fashion. How do they do it? How is such skill taught to young students who are basically thinking like children, without the ability to impose executive thinking on themselves? Trial and error strategies work well with adults, who are used to working out solutions without the help of others. Children require more help from the teacher in terms of molding and forming the bow arm. After a child has studied the violin for, let’s say six months, he or she will have developed a personal, functional bow arm. Because this foundation will allow new attributes to blend in, it should feature smooth movement and good rhythm. This is an interesting development because the style and function of the bow arm depends on many factors, which often are independent of what the teacher tells the student. 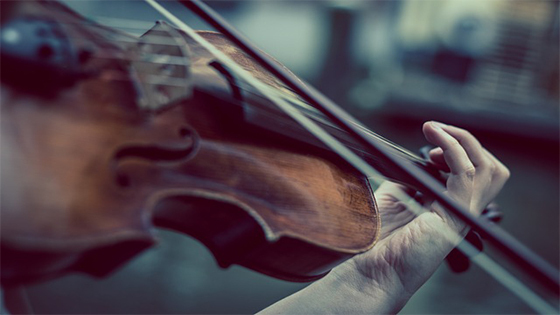 The child’s perception of how the bow hair and string intertwine, merge and co-exist will determine the amount of scratch and smoothness in his or her tone. Depending on the child's natural talent, he or she will create a bow arm that, at best, is independent of the left hand, or at worse, stiffens or collapses whenever the left hand distracts it. Since the bow arm in children is largely unconscious, and is guided by the teacher’s instructions only to the extent possible, it becomes a tabula rasa for future growth. Since every child is different, the resulting bow mechanics and sound become identifying features of the player. Just as a person has no control over his fingerprints, the bow arm exists within its unique identity. It could aptly be called “bowprint,” a learned technique that the young child uses intuitively. While it can be changed, this natural "bowprint" should be respected and appreciated. The teacher may not agree with how the bow arm is emerging, but it’s important to recognize that this is the child’s personal, unique bow arm, and it is creating an environment in which growth and maturity can take place. It seems that young children don’t often respond to a teacher’s points, but they do notice his or her persistence. As the bow arm develops, the tactile connection between hair and string takes on more sophistication. Bow distribution can also be imparted at an early age. The qualities that make the violin unique can be taught at any time, and the earlier the better. A smooth, organic connection between the hair and the string. Understanding how the hair responds to the different thicknesses of the strings. The subtlety of the “lever effect” is felt so that the bow doesn’t choke the string as it moves towards the tip. Quarter notes having a faster bow stroke than half notes. Upbows do not have to start in the upper half. Staccato notes do not need to stop and press at the end of the stroke. The shortness of the sound and the sharp attack come at the very beginning of the stroke. Even though music is a language that depends so much on the subtle connection between the ear and the mind, it is usually taught with an emphasis on how things look. Therein lies the difficult paradox that shadows musicians throughout their lives. No one can question the value of disciplining the body and learning the conventions of a good bow hold. But this type of practice cannot replace the more important lesson that is harder to teach: that the bow and the body should follow the sound. The mind needs to direct the bow in such a way that, by telling the bow what sound it should it get and how the connection between the hair and the string should feel, the other parts of the body will do whatever is necessary to achieve that goal. February 3, 2016 at 05:41 PM · Form follows function. February 4, 2016 at 02:55 PM · This is such an enlightened viewpoint. In our pursuit of perfect technique, we forget music's true purpose: to bring joy to both player and listener. If you are producing the sound that you want to hear, your ear is your best guide. I get criticized for propping my violin a little lower than my neck, but it feels more ergonomic for me. I have also noticed many symphonic violinists holding the bow six inches or more from the frog. I used to insert my thumb between the bow and the bow hair for greater leverage as well. Loosen up, technical detractors, don't swallow the camel while you snap at the fly! February 5, 2016 at 09:08 PM · It's true: trial-and-error does work. Start all over the place, then dial it in . . . Just mimicking good players is profitable. February 8, 2016 at 04:55 AM · Attn to 70.210: I remember in college that certain things in my practicing felt better than other things. Holding my right knuckles a certain way would unleash freedom I had never experienced before. Did I need to do it the way my teacher told me, or the way I saw it in a book? The answer was no, but I was too young to realize it. Was it the teacher's fault that I couldn't feel more creative and individualistic? No, because the teacher's job is to teach, and he's doing the best he can. The student's job is to become a great musician. It's his choice whether he's going to pick the right road.